You can easily reorganise your music collection by creating new folder structures and copy or move your selected tracks to these. For instance, you may wish to have all tracks of a certain genre in one folder. Create a playlist that holds the tracks you wish to manage. New Playlist Manager offers many different ways to achieve this. Select the playlist by ticking the box. From the menu choose the "Copy/Move Playlist to folder" option. You can only select one playlist. Click OK and the playlist tracks will now be copied/moved to the new folder. Be Aware when selecting "move"
the selected tracks will be deleted from their original location and the playlist deleted as this no longer holds valid references. 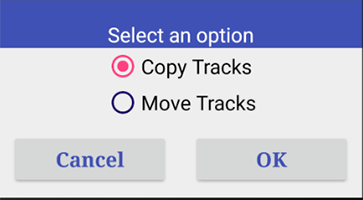 As you now have changed the locations of your tracks, your android device will need to rescan to pick up the new locations. You can either use a suitable app or simply reboot the device. after a successful copy or move, a rescan must be completed to register the altered file paths.